This document is Copyright © 1995 by Guenther Eichhorn. It may be freely distributed in its entirety provided that this copyright notice is not removed. It may not be sold for profit nor incorporated in commercial documents without the author's written permission. This article is provided "as is" without express or implied warranty. I would like to thank everybody who took the time to send me their comments. Many of them contributed substantial material for this FAQ. In particular I would like to thanks Steve Pennypacker for writing some of the paragraphs in this FAQ list and the list of aerobatic aircraft. First a Disclaimer: Any descriptions of aerobatics figures should not be interpreted as instructions. No pilot should attempt to fly any of these figures in aircraft not certified for aerobatic flight. Further, no pilot should attempt these figures without training from a competent aerobatics instructor. These descriptions are incomplete as instructional material and will get you into trouble if you believe that they are. Aerobatics competition flying is organized in the USA by the International Aerobatic Club (IAC). It is a sport that requires skill and practice. If all the rules are followed, it is quite safe. There are several dozen regional competitions each year in the US. Once every two years, the World Aerobatics Championships are held. They are in different countries each time and attract the best of the world of aerobatics competition. If you have information about the aerobatics organization in your country, please let me know so I can include it in this FAQ. The subject line will be ignored. You will receive a message back, stating that you are subscribed to the list and instructions on how to unsubscribe. If you do not receive this message, then the subscription failed. This can be because the program takes your e-mail address from the "From:" line. This may not work if your mailer doesn't include the correct address in your message. You then have to use the on-line signup-form. Please do not send subscribe or unsubscribe messages to the list itself at acro@aerobaticsweb.org. They get distributed to everybody on the list, which is quite a nuisance. Once you have signed up with the list, you will receive a message that lets you know how to use the list. This e-mail distribution list is intended to distribute information about aerobatics flying and the IAC in general. We plan to distribute contest schedules and contest results, as well as safety tips, etc. We hope it will also be used as a forum for discussions about aerobatics flying, questions and answers concerning IAC rules, etc. How it is used is up to you all. There is just one restriction: It cannot be used for any commercial purposes. Please understand that this e-mail distributer is located on institutional computers and cannot be used commercially. If you have any questions, need help with anything, or something doesn't work, please contact Guenther Eichhorn. You can just click on his name and send a note through the form that comes up. Probably the most popular instructional book for learning aerobatics is "Fly For Fun", by Bill Thomas (available from EAA). It does a very good job of explaining the maneuvers and how to fly them. The book has a couple of shortcomings, however. One is that it doesn't go much beyond the maneuvers themselves into other things you'll probably want to know. The other is that it assumes you're flying a Pitts, which isn't the best choice for beginning acro. This does make a difference, as performance characteristics and visual cues are quite different than a lower performance trainer, such as a Decathlon. If you're interested in competition, Thomas' "Fly For Fun To Win" is also recommended. The second book is Mike Goulian's and Geza Szurovy's new book, "Basic Aerobatics". Few people on this list had seen the book yet. It also does a good job of describing the maneuvers, but it also goes into lots of other subjects like physiology and conditioning, safety, aerobatic preflights, and costs of ownership. It also assumes you're in a Decathlon, which is probably what you'll be flying. Another book is Primary Aerobatic Flight Training with Military Techniques" by Lt. Col. Art Medore, USAFR (ret). It has five sections which include detailed ground study on a variety of topics and a curriculum for 12 flight lessons. It also offers a section on transition from tricycle gear to tail-draggers. There are appendices for manufacturers' recommended entry speeds for maneuvers covered in the text. The aircraft covered are: Beech Musketeer Sport III, Cessna Aerobat, Champion Citabria, Beech T-34, Stearman PT-17, and North American T-6. The lesson curriculum begins with simple warm-up exercises (air work), military chandelles, and lufberry turns. Advanced maneuvers covered at the end include the reverse Cuban eight, the avalanche, inverted spins, hesitation rolls, and inverted turns. Simple sequences of maneuvers are covered and there is an introduction to Aresti diagrams. The new second edition printing is now available from a dealer (and aerobatic pilot) in England. First I want to emphasize that you should do aerobatics only in airplanes that are approved for aerobatics. It is potential suicide to try aerobatics in any other airplane. Other planes are not stressed for this type of maneuvering and they WILL break. Please don't do it! A list of aerobatic airplanes is available at /ACRO/acro_planes.html with a summary of their features. If you know any of the numbers that are missing, or know of any other aerobatic airplane (not one-of-a-kind planes though) please let me know about it. For more advanced aerobatics the most popular trainer is probably the Pitts S-2A or Pitts S-2B. Most other higher performance aerobatic planes are experimental and cannot be used for regular flight instruction. It obviously is much less costly to get started in a Citabria or a Decathlon than in a Pitts. And both are good enough to teach the basics of aerobatics. The C-150 Aerobat is very limited in the type of aerobatics it can do. It seems to be a consensus on the IAC e-mail list that it makes sense to get started in one of these trainers and then move up to a Pitts to work on more advanced aerobatics. A description of a list of aerobatics figures is available at /ACRO/acro_figures.html. Here is a summary that tries to explain the difference between maneuvers that are often misunderstood on the rec.aviation. * newsgroups. Aileron rolls are flown with the rudder and elevator in the neutral position during the roll. The aileron is fully deflected in the direction of the roll. This is the easiest of the rolls to fly. The aileron roll is started by pulling the nose up to 20 - 30 degrees above the horizon. The elevator is then neutralized and the aileron fully deflected in the direction of the roll. The controls are maintained in that position till the roll is completed. After the roll is completed the nose is usually 20 - 30 degrees below the horizon. The aileron roll is not a competition maneuver. Slow rolls have to be flown normally on a straight line (exception is the avalanche). The roll rate has to be constant and the longitudinal axis of the plane has to go straight. This requires constantly changing rudder and elevator control inputs throughout the roll. Hesitation or point rolls include stops at certain roll angles. The number on the base of the roll symbol describes the number of points the roll would have if it were a 360 degree roll. Allowed are 2 point, 4 point and 8 point rolls. The fraction on the arrow of the roll symbol describes what fraction of a full roll is to be executed. If no points are specified, rolling is done without hesitations. If no fraction is specified, a roll symbol that starts at the line specifies a half roll (see description of the Immelman). A roll symbol that crosses the line specifies a full roll (first figure). The second figure shows the symbol for 2 points of a 4 point roll (adding up to half a roll) from upright to inverted flight. Snap or flick rolls also have to be flown normally on a straight line. A snap roll is similar to a horizontal spin. It is an autorotation with one wing stalled. In the regular snap, the plane has to be stalled by applying positive g forces. In an outside snap, the plane is stalled by applying negative g. In both cases rudder is then used to start autorotation just like in a spin. The Barrel Roll is a not competition maneuver. I The barrel roll is a combination between a loop and a roll. You complete one loop while completing one roll at the same time. The flight path during a barrel roll has the shape of a horizontal cork screw. Imagine a big barrel, with the airplanes wheels rolling along the inside of the barrel in a cork screw path. During a barrel roll, the pilot experiences always positive G's. The maximum is about 2.5 to 3 G, the minimum about 0.5 G.
There was a confusion about the difference between a wingover and a hammerhead turn on the rec.aviation. * newsgroups a while ago. Here is a description of the two maneuvers. The Wing-Over is a competition maneuver in glider aerobatics. You pull up and at the same time bank the plane. When the bank increases past 45 degrees, the nose will start to drop while the bank keeps increasing and the plane keeps turning. Halfway through the maneuver, the plane has turned 90 degrees, the fuselage is level with the horizon and the bank is 90 degrees. The plane is above the original flight path. The nose then keeps dropping below the horizon and the plane keeps turning, while the bank is shallowed. When the bank drops below 45 degrees, the nose is pulled up towards the horizon and the plane reaches horizontal flight with wings level after 180 degrees of turn. At the completion of the maneuver, the plane is at the same altitude as on entry and flying in the opposite direction. It starts with a quarter loop into a vertical climb. When the plane stops climbing, it pivots around its vertical axis (which is now horizontal).The nose moves in a vertical circle from pointing up through the horizon to pointing down. After moving vertically down to pick up speed again, the maneuver is finished with the last quarter of a loop to horizontal flight. This figure can have optionally rolls on both the up-line and the down-line. The quarter loop is flown just like the first part of a loop. When the plane is vertical, the elevator backpressure is released completely. During the vertical line up, some right aileron and right rudder is needed to maintain the vertical attitude because of the engine torque and p-factor. When the plane has slowed enough, full rudder initiates the turnaround. It is followed by right-forward stick (right aileron and forward elevator) to keep the plane from torquing off. The pivot is stopped with opposite rudder when the nose points straight down. When the pivot is completed, the ailerons and rudder are neutralized. Elevator and rudder are used to keep the nose pointing straight down. The pivot must be completed within one wingspan. Rolls on the downline require only aileron input if the plane is trimmed correctly. This maneuver is sometimes called a hammerhead stall. This is not an accurate name because the airplane never stalls. The airspeed may be very low, close to zero, but since there is no wingloading during the turn-around, there is no stall (at zero g wing loading, a wing does not stall). The plane is flying throughout the maneuver with all the control surfaces effective (although sometimes only marginally so). The previous paragraph is true even for gliders that don't have the support of the propeller slip stream. The missing slip stream makes it much more difficult to keep some flow over the control surfaces during the turn-around in a glider. 3300' x 3300' centered on the judges line. The lower limits of the box are, for safety reasons, strictly enforced. The International Aerobatic Club (IAC) has over 6000 members. Probably about 800 of these are active competition pilots. Competitions are held locally throughout the US. There are two national competitions, one in August in Fond du Lac, Wisconsin, and the other in September in Dennison, Texas. In regional competitions there are usually between 30 and 60 competitors, in the national competitions there are usually between 100 and 150 competitors. The regional competitions are3 held on weekends, the national competitions last one week. There are five categories of aerobatics competition: Basic (the beginners category), Sportsman, Intermediate, Advanced, and Unlimited. Every competitor flies three sequences of aerobatics maneuvers, a Known sequence, a Freestyle and an Unknown. A competition sequence is composed of set of aerobatic maneuvers selected from a catalog of allowed figures. The Known sequence is the same for each competitor in a category. It is the same throughout a competition year, and changes each year. The Freestyle is a sequence that each competitor designs according to certain rules. The Unknown is selected by IAC headquarters for each contest. The competitors receive these Unknowns the day before they fly it and are not allowed to practice the sequence. The competition is flown in the aerobatics box (see above). Penalties are assessed for flying outside the box. The number of points deducted for each boundary infringement depends on the competition category and is higher in the higher categories. The most severe penalties are given for violiting the bottom of the box. For Basic and Sportsman, a violation of the lower altitude limit zeroes the complete flight. This is designed to enhance the safety of aerobatics fling by enforcing safe altitudes during a contest. The flying is judged by judges on the ground. There are specific judging criteria for each figure. All allowed figures are specified in a catalog. These aerobatic figures are the same world-wide. Each figure is assigned a difficulty factor. The final score for each figure is then calculated from the score that the judges give for each figure (in the range of 0 - 10), multiplied by the difficulty factor. The total score for a sequence is the sum of the scores for each figure. To become a judge requires participation in a judges school and assisting judges during several competitions. Each judge has to complete a re-validation exam every year and needs to judge a minimum anumber of competition flights in order to remain on the current list of judges. The IAC maintains the most comprehensive list of aerobatics schools. If you have a World Wide Web browser, you can access the list at Aerobatic Schools. It is also periodically published in the IAC magazine, Sport Aerobatics. You can also call IAC at 920-426-6574 and ask for a list of local schools. In addition to names, locations and phone numbers, the IAC list also includes aircraft types and rates used by each school. Note that inclusion or exclusion from the list does not constitute any sort of endorsement or qualification by IAC. If you don't find what you're looking for on the IAC list, the next step might be to contact a nearby IAC chapter and ask for recommendations. A list of IAC chapters is on the World Wide Web at /ACRO/chapters.html, or you can call IAC at the number listed above. Of course, you can always ask around at your local airport, or put out a request on the rec.aviation newsgroups. Once you've found a school, check them out! This can't be stressed enough. Get references from pilots who have taken instruction with them. Find out how long they've been in business, and how much and what type of aerobatics experience they have. What kind of a reputation do they have? Are they self-taught weekend warriors who recently bought an aerobatic airplane, or are they Unlimited-level competition pilots with 20 years of experience? What kind of airplanes do they fly? What condition are they in? Have they had any accidents? Will they rent the airplane to you (solo) after you've completed the course? Aerobatics entail forces and visual situations that are new to just about everyone. Each person will respond differently to these. Typically, on your first few flights you may feel queasy after some number of maneuvers. With each flight, your tolerance will build and you will feel a bit better and better, until you eventually find that you feel perfectly fine at the end of a flight. Don't let the initial discomfort discourage you. It's natural, and the end result is well worth it! The more often you practice, the higher your tolerance will become. There are a few ways to minimize the discomfort. The first is to know when to quit. Once you start feeling queasy, flying one or two more maneuvers is a great way to get yourself sick. Instead, take the controls. This will help take your mind off of how you're feeling, and will also help your brain resolve what it's feeling with what it's seeing. Fly straight and level for a few minutes. Open the vents wide, and keep your eyes looking outside the cockpit. If you continue to feel sick, you may want to think about landing. You'll probably also find that when you fly the maneuvers yourself, you won't feel bad as quickly as if someone else (i.e.- your instructor) is flying. This is probably because when you're handling the controls, you have a better idea of what to expect. Seating position is also a factor. For example, people seem to do better in the front seat of a Decathlon than in the rear. Can I do acrobatics in a non-Aerobat C-152? Sure, you *can*. HOWEVER: If the maneuvers are not listed as approved in the Pilot's Operating Handbook, you have done something illegal (and quite stupid to boot, since it would be quite dangerous). The changes made to the C-150 & C-152 are not very visible, but are extensive. Cessna was worried about people doing aerobatics in the non-aerobatic version, so the original paint jobs given the aerobatic versions were quite distinctive. What might confuse things a bit for the uninformed is the appearance of a "normal" airplane doing aerobatics at a local airshow. An experienced acro pilot should be able to put on a decent aerobatic show in many of the "standard" category aircraft. There are a couple of problems with this, though. THERE IS NO ROOM FOR ERROR! Aerobatic category ships have a strength reserve for the maneuvers for which they are approved. For example, even a low power/weight craft should be able to do a nice loop and not exceed +3 G's. A normal category plane is certificated to +3.5, aerobatic to +6. A Bob Hoover can do it safely, you can't. The other problem is, if you do maneuvers outside what's listed in the POH, you now have an experimental airplane. Hoover's Shrike and other "normal" category airplanes on the airshow circuit, have been re-certificated under Experimental-Airshow/Exhibition. Do I have to wear a parachute when I do aerobatics? Wearing parachutes for aerobatics flying is regulated in FAR 91.307. It specifies that whenever you carry a passenger, you may not exceed 60 degrees of bank or 30 degrees of pitch up or pitch down unless both occupants wear an approved parachute. This means that you do not have to wear a parachute when you fly alone. It does not say anything about aerobatics, it just specifies the bank and pitch limits. So any maneuver that exceeds these limits falls under this rule and requires you and your passenger to wear a parachute. Get proper training, especially in all types of spins and botched maneuvers. Know your equipment and yourself, and keep both well maintained. Don't overstress the airplane (and never fly aerobatics in non- aerobatic aircraft). Set and observe strict personal limits (altitude, g-limits, flight duration, health, etc). Stay current and take recurrency check rides. Stay clear of conflicting traffic, either with regular clearing turns or an observer on the ground. Know how to handle emergency situations. Always wear a parachute. Know how to bail out and use it. Learn by others' mistakes, not your own. 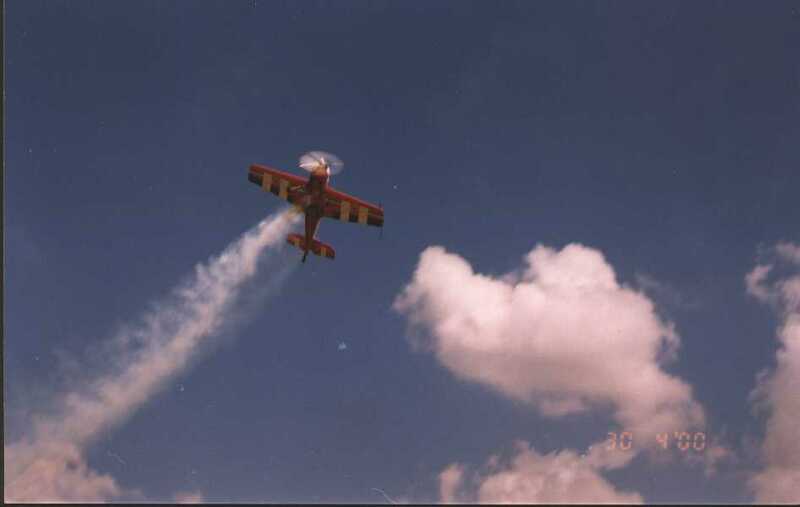 An example of how safe aerobatics can be is that there has never been a fatality in IAC-sanctioned competition, where strict safety rules are always followed. The penalty for ignoring safety procedures can be quite high. A review of NTSB accident data for the 8KCAB Decathlon (probably the most common aerobatic trainer) from 1983 through 1993 shows 14 accidents related to aerobatics. Eight of them involved attempting aerobatics at low altitudes. One was caused by lack of training, one by lots of unsecured loose baggage (ie- lawn chairs and more) floating around the cockpit, and one by structural failure. Causes of the remaining three are less clear from the reports, but two appear to have been due to low level aerobatics, and the third by failure to recover from a spin. So, of the 14 accidents in ten years, all but one (structural failure) could have been prevented by following the few simple rules listed above. The structural failure was in a known problem area and *might* have been avoidable if the pilot was more familiar with his equipment. With higher performance aircraft and more advanced aerobatics, there are additional risks. The airplanes are less forgiving, the forces on plane and pilot are higher, some of the equipment is newer and less proven, and much of the flying is done at lower altitudes. Also as skills and experience build, complacency and bad habits can begin to creep into the picture. By the time you get to this level, you won't need this FAQ to learn how to manage these risks. One thing is for certain. Once you have learned to fly aerobatics, your increased knowledge will make all the rest of your flying safer. If you want to answer one of these so I can include it in this FAQ, please send me something. - Why do people learn aerobatics? - How do I learn aerobatics? - What type of plane should I learn in? - How do I get involved in competition? - What is the Aresti system, and how do I read the symbols?